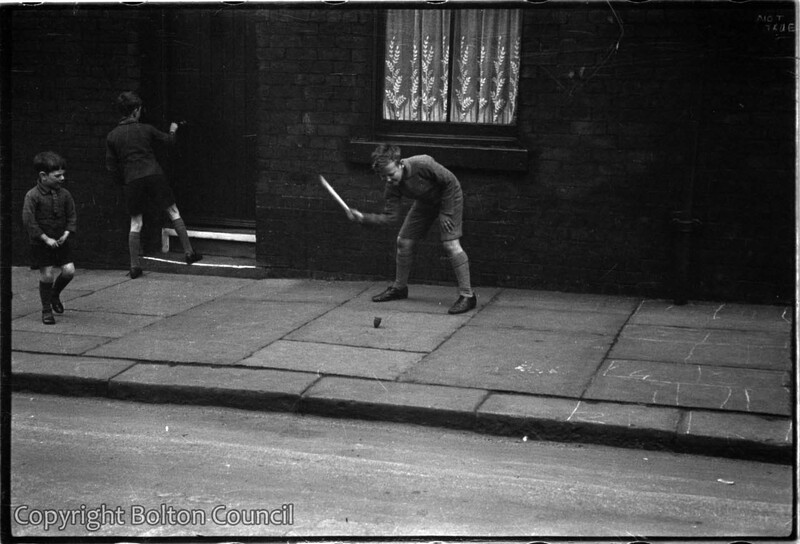 Children play with a top and whip outside a terraced house. There are chalked marks from a game of hopscotch on the pavement. This photograph was probably taken on Snowden Street, near to where the Mass Observation team lived at 85 Davenport St.
Like most streets there are markings on the tarmac off the metal wheel rims.. Most likely the co-op milk horse and cart. That’s a nice detail Norman. Thanks for sharing. It would be great if someone could confirm whether or not this is Snowden Street, as I have a grandparent who lived at number 6. I have discovered that my grandmother and her siblings, along with my great-grandparents lived at both no.6 and no. 19 Snowden Street (according to 1901 and 1911 England Census).